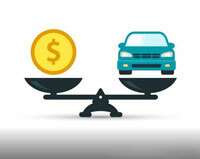 Most buyers, dealers, and financial institutions, use some sort of vehicle pricing guide to determine the value of a vehicle. The most popular is the NADA Official Used Car Guide, or similar publications like Edmonds, Kelly's Blue Book, Black Book, etc.. These buying guides (and web sites) normally contain the market's retail, wholesale, and loan values for used vehicles. These prices are based on the current used car sales in a specific region of the country and include additions and/or deductions for equipment packages and for low or excessive mileage. The major flaw of these publications is that there is no deductions for existing mechanical problems and deductions if the vehicle has been in an accident. These publications can not distinguish between two identical vehicles, one well-maintained vehicle, and one with existing mechanical and/or structural problems. The difference between these two cars can be hundreds to thousands of dollars in value. Many of these publications instruct you to "Deduct for Reconditioning", but give no instructions how to calculate these deductions. A professional inspection from an ASE Master Technician should give you the dollar amount for any repairs or needed maintenance items. Buyers should take that amount and subtract it from the published book value. This will give the buyer the true value of the vehicle. The Technician should let you know if the vehicle was abused or well maintained. This also affects the price of the vehicle. Don't decide by looks alone - every used car should be clean and good looking. However, an Auto P. I. inspection will determine existing problems such as previous accident damage, odometer discrepancies, needed mechanical repairs and maintenance items, prior shoddy repairs, misuse and abuse, etc.. Once you purchase, these problems can cost hundreds to thousands of dollars to fix. Why buy a vehicle for more than its true value. Without a professional inspection, you could be buying someone else's problem vehicle.